Birds have always fascinated us, flying freely with beautiful feathers and lovely songs. 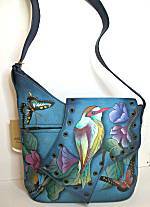 From the big eagle to the petite hummingbird,this page gathers some of our bird motifs for jewelry, accessories and gifts from the artists available at The Artful Soul. 1-3/8 inch long including sterling earwire, 1/4 inch across. Darling little brass cutout of birdhouse has a silver triangle charm for roof, silvertone bird dangles below. 1 inch long including goldfill earwire, 3/8 inch across. The little brass metal owl has lightly etched details and darkened areas to imply all the details. 1 inch long including sterling earwire, 3/8 inch across. The little silver metal owl has lightly etched details and darkened areas to imply all the details. 1-3/8 inch long including sterling earwire, 3/8 inch across. Silver metal cut and lightly etched to reveal the front-facing owl. 2-1/8 inches long including silver coated surgical earwires, 7/8 inch across. Fat leaf-shaped convex metal shape, lightweight, glimmering white backing. The artwork is a snippet of "Hummingbirds" by Ernst Haeckel. 1-1/2 inches long including sterling earwires, 5/8 inch across. Slightly convex leaf shape, lightweight, glimmering white backing. The artwork depicts pink flamingo standing against black background. 1-1/2 inches long including sterling earwires, 5/8 inch across. Slightly convex leaf shape, lightweight, glimmering white backing. The artwork depicts screech owl on tree branch in white, green and navy blue colors. 8-1/2 x 5-1/2 inches across the top, sides are 1-1/4 inches tall with slightly flared and graceful style. Cutout handles on each end. 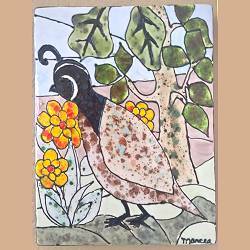 The interior has a satin white background covered almost completely by a multicolor painting of a quail family in brushed glazes. There is purple, green, blue, orange-yellow and gray. The sides are glazed in a crystal pattern of pink with aqua and navy blue. This piece is not signed, but is by Marcea Reid of Henderson, Nevada. 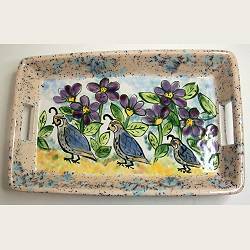 The tray is an earthenware lowfire clay that is food safe and water tight from the glazing and fired at almost 1900 degrees. Fat and roomy pitcher measures 7 inches tall, 6 inches across (8 inches with handle). 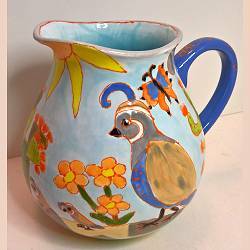 Glazed with a quail family motif, outlined in orange, with cactus, sun and flowers. Colors are orange, blue, aqua, green, yellow, gray and tan. Glazed aqua blue inside, ready for liquids and delightful serving when not just being displayed as an art piece. Signed "Marcea" on the bottom (Marcea Reid of Henderson, Nevada), the vase is a purchased earthenware lowfire clay that is food safe and water tight from the glazing and fired at almost 1900 degrees. 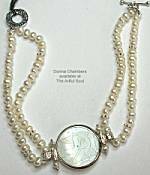 1 inch sterling medallion is suspended from 18 inch sterling chain with spring ring clasp. The two birds on a branch are hand cut from sterling sheet, and polished. By Annaliese Cassarino of La Jolla, California. 4 x 4-1/2 inch ornament made with nickel, brass and copper, the baby hummingbird has his delicious flower amid leaves and colorful beaded accents in the wings. Metal pieces are soldered and wire-wrapped together, beads also are wrapped into the piece with wire. Comes on 2 inch silver hook hanger. 6-1/2 x 2-1/2 inch ornament made with nickel, brass and copper, the Proud Peaock has colored glass within its tail feathers and dangling freely below. Metal pieces are soldered and wire-wrapped together, beads also are wrapped into the piece with wire. Comes on 2 inch silver hook hanger. 2-1/4 inches long including sterling earwire, 7/8 inch across, the polished pewter shape with brass wire curls could be interpreted a variety of delightful ways...the head of a long-necked bird, the full body of a bird, a leaf. Small colored stones above. How Fun! Polished pewter shapes of cow and chicken have stamped patterns and brass accents soldered on top. LAPIS beads on the sterling earwire. About 1-3/8 inches long and 3/4 inch across. 2-1/4 x 1-3/8 inches, the polished pewter has stamped designed and brass wire spirals, vertical barpin clasp. The shape can be interpreted in various ways...perhaps the head of a long-neck bird, a plume or leaf, a full bird with tail!